I grew up in a really small town in the American South. In my town, there were only blacks and whites. Integration came along after I had started school. Given the times and the place, my town, my parents, and I took it all very well. It even so happened that by the time I finished junior high school, my best friend was black. It wasn’t something I deliberately chose; I just liked him best of all my friends. We left that town, and moved to a larger one, and then a couple of years later to an even larger one. I got to know Latinos, Asians and Jews. In college, I counted among my mix of friends a man from Zambia, and another from Japan. Neither of them was as weird as the guy from Idaho. My life has been one of increasing exposure to the wonderful and fascinating variety of cultures in our world. I have yet to travel outside the US, but I did choose to move to Washington, DC, and here I have met people from all over our planet, and some I have gotten to know very well. As I was moving toward increasingly urban environments, the world was growing closer together. This shows up not only in our commodities, but also our literature, art, and music increasingly come from far corners of the world, and sometimes sounds from many places will be blended together on one song. Far from being cacophonous, it merges well. And yet this rush to a smaller and smaller planet has been disorienting, too. Five years ago the United States suddenly woke up to realize it wasn’t universally loved, but many of its citizens didn’t know why—and unfortunately many still do not. More and more English is challenged not only online, but in the streets and marketplaces. A few years ago I went to a Salvadoran eatery wearing a DC United jersey. The waitress assumed since I liked soccer, I had to be able to speak Spanish. Fortunately, I knew enough to order food. … there are two strands that intertwine in the notion of cosmopolitanism. One is the idea that we have obligations that stretch beyond those to whom we are related by the ties of kith and kind, or even the more formal ties of a shared citizenship. The other is that we take seriously the value not just of human life but of particular human lives, which means taking an interest in the practices and beliefs that lend them significance. People are different, the cosmopolitan knows, and there is much to learn from our differences. Isn’t this multiculturalism? No, says Appiah. Too much that goes on in the name of multiculturalism defeats freedom—forbidding us to critique human rights abuses in other cultures, for instance—and the cosmopolitan is for freedom, for the individual, particular human life, and his or her longings and needs. That is why Appiah opposes facile “cultural preservationism,” the mistaken belief in cultural purity that must be preserved. Many a Western intellectual has decried the appearance of t-shirts and ball caps in the remotest village of the Amazon. They say that U.S. lead capitalism is destroying the world. But Appiah believes that if the inhabitants of these far villages really want to wear the t-shirts and ball caps, they should be free to do so. To deny them is to be against their rights and dignity as individuals. Besides, there are no pure cultures. From time immemorial, cultures have been interacting, trading goods and ideas. And often the result has been more positive than those of cultural isolationism. The Romans borrowed from the pantheon of Greek deities, and then later from a monotheism out of a provincial backwater, itself a fusion of ideas from all over the ancient world. You favorite Italian dish probably wouldn’t exist without tomatoes originating in the Western Hemisphere or the idea of pasta from China. These are things everyone knows; few understand. Appiah argues that it is the very nature of culture to grow and change, by interacting with other cultures, incorporating elements of the others or reacting to them. To preserve a culture in its purity condemns it to stagnation and its individual members to a prison. 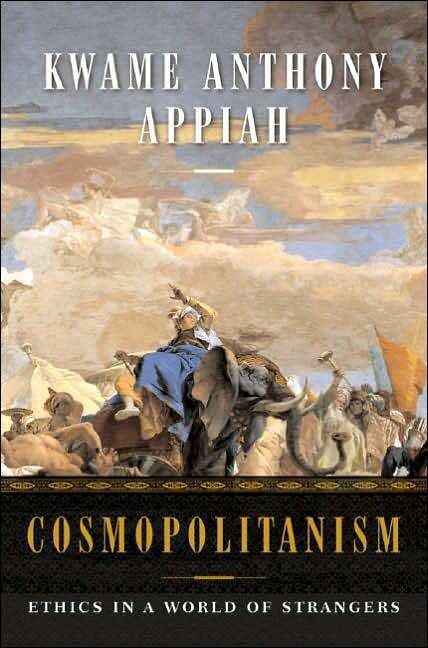 Rather than facile multiculturalism and cultural conservation, Appiah calls people to a “conversation.” There are certain values a cosmopolitan will hold, about human dignity and freedom for instance, but how these values are to be carried out in individual lives and in various cultural settings require a frank and open discussion about our individual aspirations and worldviews. Appiah rightly argues that while the discussion can involve the rational, the appeals to change and acceptance will come not from rational argument, but from accustomization. The changes in the perception of women’s roles in society and the acceptability of gays and lesbians has come not through persuasively rational arguments, as much as through increased visibility of women in the workplace and gays and lesbians in public and in the media. People have simply gotten used to the ideas, and as a result their resistance has diminished. So it will be with our intercultural conversation. We, as cosmopolitans, will seek to understand each other better, and though we will never completely agree, we will learn to accept each other, and greet each other as sovereign individuals with imperatives and values we often share even if we carry them out differently. And while toleration of difference is a hallmark of cosmopolitanism, that toleration is counterbalanced by valuing individual human lives. For instance, a cosmopolitan would not simply accept that curtailing the rights of women or the execution of gays in Muslim societies, but rather would promote the elevation of the status of those two marginalized groups within a Muslim context. Given that cultures evolve, in other words, our duty as persons who value the dignity of every particular human being is to promote the evolution of cultures in a way that they promote the value of every human being within those cultures. If Cosmopolitanism is about how the individual greets the world, then Covering is about how the individual presents herself to the world. Kenji Yoshino teaches law at Yale, and he believes he has discovered the final frontier of our struggle for civil rights. He interestingly starts with the civil rights of gays and lesbians, but extrapolates from that struggle to the struggles for rights for women, ethnic minorities, the disabled and beyond. Until very recently, gay people were forced to convert—to try to become straight, sometimes by means of horrifying physical and psychological torture (some of which even today can be found in the “ex-gay” movement). Progressing from “conversion,” gays and lesbians were required to “pass” for decades, to present themselves as straight, regardless of how they see themselves or behave in private. Finally, as gays and lesbians have come to be more accepted; the latest requirement is that they “cover”—–be gay but don’t be too vocal or too flamboyant. Covering means: not overly expressing who you are. In a work context, a gay man will often be expected not to behave or dress flamboyantly. He may be expected to “butch it up,” and while his co-workers may know he is gay, he may be discouraged from keeping a picture of his partner at his cubicle, or at least from bringing him to the annual holiday party. An African-American may be expected to dress more conservatively—leave the mud cloth at home, for instance—to be able to advance in his job, or perhaps to keep it. Women, particularly, are asked to walk a fine line, being held back for being too feminine—for instance being too “touchy-feely” in managing employees—or too masculine—behaving too aggressively, too “man-like,” when trying to win a client or argue a case. Women have been held back at their jobs, not only for getting pregnant, but for being in some predetermined age-range for optimal child-bearing. Yoshino cites Franklin Delano Roosevelt as a coverer. Everyone on his cabinet knew he was confined to a wheelchair, yet he always arrived at cabinet meetings first and had himself in place at the table before anyone else, to minimize the impact of his disability. Yoshino says that whenever he starts expounding on how various groups of people are asked to cover, he inevitably gets a question from some straight white male in the audience, protesting that not only do women, ethnic minorities, and LGBT folk have to mute their individual differences—he battles depression, for instance, or has been required to cover his religious life in order to advance in the office. 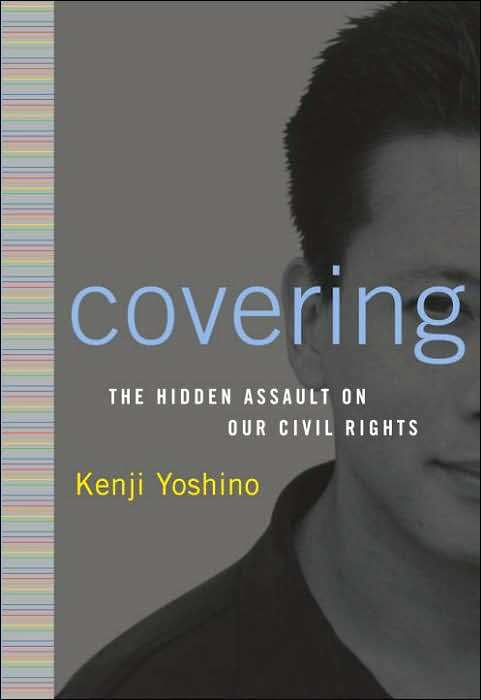 And Yoshino recognizes that this, too, is a form of covering, and just as bad as what is required for the traditionally protected rights groups. He says that the law in the US has traditionally favored immutable traits—skin color, gender, and increasingly, sexual orientation—but it has not protected behaviors. For instance, a black woman cannot be fired for being black, but she can be fired for wearing cornrows, rather than straightening her hair. Yoshino’s solution seems strange for a professor of the law, and yet it rings true: we do not need more civil rights laws to free people from covering—we need a cultural shift in our attitudes toward individual expression. We continue to be asked to assimilate—to meet certain rather narrowly defined norms in appearance, conversation and behavior. He suggests instead that we should look to see how individuals can express their true natures, without crossing a line to offensive behavior. I shouldn’t mind the gay man at work doing some gender blending or swishing, if it doesn’t hurt his job performance intrinsically, but I have a right to be offended were I to see a leather queen in buttless chaps on the subway. In working out the particulars in society of where to draw the line between what is an acceptable expression of individuality and what is offensive, Yoshino recommends a process similar to that of Appiah—a conversation. We need to get our thoughts and ideas out there and under discussion. We need to celebrate the dignity and the freedom of the individual to express herself, in her preferred cultural, ethnic, gender and spiritual expressions, and acclimate ourselves to an ever-widening variety in human life. Only as we push ourselves to acquaint ourselves with the Other—to make ourselves a little uncomfortable in order to stretch our boundaries—can we win for ourselves the right to reveal our own true natures. The discussion, according to Yoshino and Appiah may not be easy, but it will be interesting, and that will make our human lives more fulfilling and enjoyable. Both of these slim volumes pack a tremendous amount of profundity and elegance, and yet they are highly readable, and filled with personal anecdotes and reflections; this short review cannot do them justice. Cosmopolitanism and Covering ought to influence our national and international conversations on the freedoms of people to express themselves while fulfilling their obligations within society. We need to talk to one another. Kai North is a writer living in Washington, DC. He last reviewed Bilal’s Bread and The Taqwacores in the Winter 2006 issue of White Crane.